It doesn’t matter if you’re a terrible typist, struggling with carpal tunnel syndrome, or you get your best ideas when you have no way to write them down, MacSpeech’s Scribe is certain to handle the details. Unlike traditional voice recognition applications, Scribe doesn’t require that you be tethered to a computer with a wire and a mic in order to get your spoken words to the printed page. Instead, you can use virtually any handheld or other recording device (including your iPhone’s Voice Memo app) to capture your thoughts, the next chapter of your novel, or the song lyrics you came up with while driving in your car, as long as what you’re recording can be saved in any of Scribe’s 5 supported audio formats: aiff, m4a, m4v, mp4, or wav. 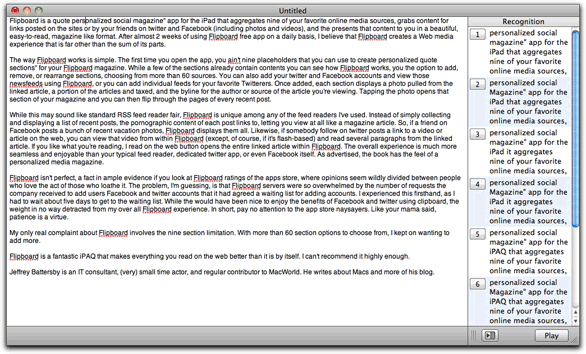 MacSpeech Scribe makes quick work of learning your speaking style with a short 120 second snippet of recorded text. To get started you need to spend a few minutes training Scribe to understand the way you speak. Scribe only needs 120 seconds of recorded speech, although the more you train the program the better it gets at being able to recognize your particular diction and speech patterns. You also have the option of feeding Scribe text files you’ve written, which gives Scribe a better idea of the vocabulary you use, making its transcription all the more accurate. While you’re definitely better off spending more training time with Scribe, I was impressed by how well the program worked once my initial training session was over. While there were words I had to change, for the most part Scribe picked up everything I said without a hitch. Unfortunately, my initial training sessions did not come off without a hitch. Before using my iPhone’s Voice Memo app I used a Snowball mic and GarageBand to record and then export audio in an mp4 format. This is one of Scribe’s supported formats, but using it always caused Scribe to crash, which ended up corrupting my speech profile, which then meant that I had to start training all over again. After contacting MacSpeech, I was told that, while mp4 files are supported, they rarely see anyone using that format and they suggested that I use a different format instead. Once I made the change Scribe worked great. Scribe’s interface for editing your text works, but is not as simple or intuitive as it could be. Once your training session is complete you can begin using Scribe to transcribe your recorded audio. The interface Scribe uses for the initial transcription is the same as the one used for training the application, but the interface Scribe offers for editing your transcribed speech (a two-column window, one which contains your transcribed text and the other which displays a numbered list of alternative transcription options) is uninspired and unintuitive. Clicking anywhere within a transcribed phrase changes the list of possible transcription options and clicking a number in the list changes the phrase in the body of your document. If none of the phrases are correct you can double-click the phrase in the list that comes closest to what you’ve said and make edits. Scribe will then make changes to that phrase in your document and update its library of words to add a new word or continue learning how you speak. I have one other complaint about Scribe. The application ships with a vocabulary library that includes about 150,000 words, but there’s no way to correct typos—few as they may be—that appear in the included library. For example, the library includes the word “MacWorld,” so it properly recognizes that word when you speak it, but the capital “W” is incorrect. I was able to add the properly spelled word to my user library, but there was no way to delete the incorrect spelling from the program’s library, so I ended up having to change each instance of the word by hand. In the rare instances when Scribe’s internal word library is incorrect the program offers no way for you to make a change. Also, it would be helpful if MacSpeech provided an easy to access list of punctuation words within the application so that you could see what you’re supposed to say to add punctuation to a document. Scribe properly recognizes punctuation and you can locate some punctuation if you dig through Web-based FAQs, but a list of what to say for punctuation would have helped me to save the time I spent making corrections. 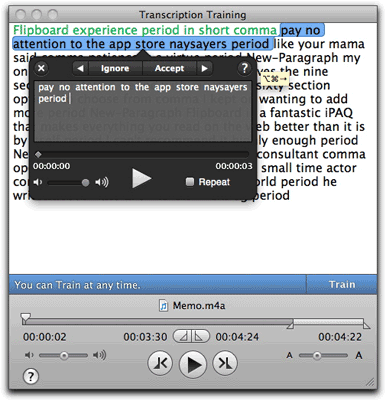 Small foibles aside, MacSpeech scribe is a powerful and intelligent tool for transcribing your recorded speech. A simple training process and access to a wide variety of standard audio formats mean that you’ll be moving your spoken text to the printed page in a matter of minutes and with a minimum of hassle. Scribe is the best, simplest way for you to get your spoken word to the printed page.